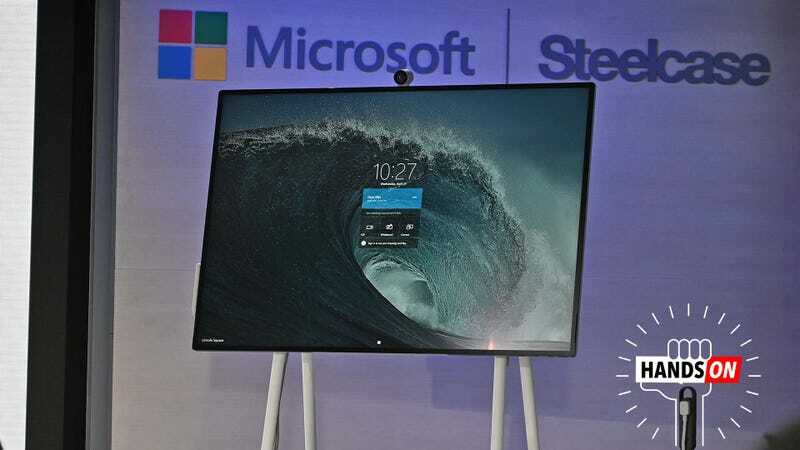 But the Microsoft Surface Hub 2S feels a bit different, a bit more advanced, and it might actually deliver on the promise of making collaborating with your coworkers just a bit less painful. Here’s the 50-inch Surface Hub 2S with Steelcase’s Roam stand. By moving a few latches around and disconnecting the cords, the Surface Hub 2S can also be used in portrait mode. The back half of the Roam’s sotrage compartment is reserved for the Hub’s battery, but the front can be used to store cables, papers, and whatever else you need for a meeting. There’s so much synergy going on. Sporting a big 50-inch screen with a 3840 x 2560 resolution and a 4K webcam, the Surface Hub 2S has everything you need to see up to four teammates at approximately life size all at once in full HD. But the real advancement for the Surface Hub 2S is when you pair it with one of Steelcase’s rolling stands and a built-in battery designed by APC—well-known makers of uninterruptible power supplies. Then, the Surface Hub 2S becomes a portable screen that’s damn simple to drag around to wherever you need it. Featuring an estimated battery life of around 100 minutes, the Surface Hub 2S should be able to make it through a whole meeting without being plugged in, though in most cases, that’s probably overkill as you’ll only need to unplug it when moving from one conference room to another. And because the Surface Hub won’t shut off when you yank out the cord, you don’t have to worry about losing your work if you need to move that big screen around. I’m not sure if it takes this long to import images all the time, but regardless, it’s faster than drawing the original picture a second time. But the most impressive thing about the Surface Hub 2S is just how slick it is. In Microsoft’s Whiteboard app, there’s a tool that can automatically read your handwriting, and then automatically “beautify” it so that anyone you work with isn’t forced to try to decipher your chicken scratch. Then there’s another feature that can import a regular picture, and then transform it into a digital drawing, as if it had been inked in the Whiteboard app. 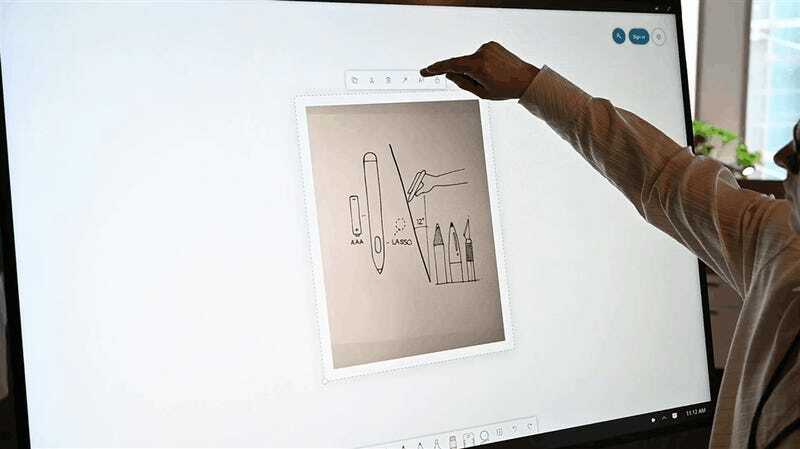 Of course, like the rest of Microsoft’s recent computers, the Surface Hub 2S comes with full precision Windows Ink support and an included stylus. Also, I have to mention I appreciate the Surface Hub 2S’ matte screen, which does a good job of cutting down on reflections while also giving it a nice texture for sketching or jotting down notes. Here’s a closer look at the Surface Hub 2S’ included battery, which should make moving the thing from one room to another much less of a hassle. And in case a 50-inch screen just isn’t enough, there’s also an 85-inch version of the Surface Hub 2S that Microsoft cleverly designed so that when the smaller version is set up in portrait mode, it lines up perfectly with an 85-inch model in landscape orientation. No, you won’t be able to complain about not having enough screen. That said, I can’t comprehend where this tech finds its market. With a starting price of $9,000 for the 50-inch model, the Surface Hub 2S is anything but cheap, even for large businesses. And that’s before you figure in Steelcase’s wheeled $1,450 Roam stand, which with its built-in storage area for the Hub 2S’ battery, is kind of an essential accessory. But if you’re an IT manager with a lot of money looking to gear out your office, the Surface Hub 2S might be the most ballin’ collaboration tool Microsoft has come up with yet.